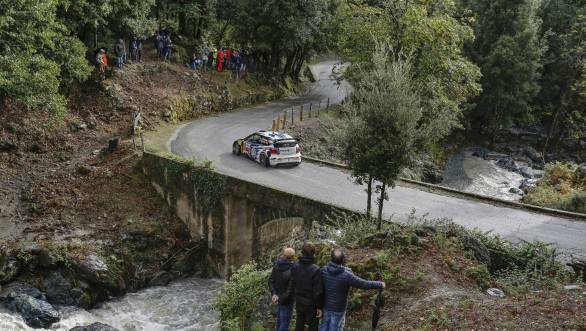 Jari-Matti Latvala scored his second successive victory on the Rallye de France (Tour de Corse), this time run on the traditional rallying island of Corsica, surviving atrocious first day conditions and enjoying some fortuitous moments on the way. On his first time at this remarkable, Elfyn Evans finished second, redeeming himself after a very lacklustre rally in Australia and impressively holding off a determined challenge from Andreas Mikkelsen. The first WRC event in Corsica for seven years provided a new location to many competitors and fresh roads for many others, and of the seven stages which were eventually run, no fewer than five different drivers won stages and four different drivers took turns to lead. It was the first win in Corsica for a Finnish driver since Markku Alen in 1984. In the race for second place in the Manufacturers' series Citroen has edged in front of Hyundai, in the race for top non-Volkswagen drivers the convalescing Citroen's Mads Osberg's sixth place keeps him 12 points ahead of Hyundai's Thierry Neuville and another three before Ostberg's teammate Kris Meeke. Championship titles came to Quentin Gilbert in the WRC3/Junior category while the veteran Francois Delecour clinched the RGT Cup. It all went well from Latvala right from the start. From the moment when he survived a dramatic crash in testing (denying his teammates the chance to acclimatise to the Corsican roads) through to when he suffered gearbox problems at the end of Day 2 and did not suffer substantial time loss whereas his teammate Sebastien Ogier suffered badly for a similar problem. Nothing was going to stop him winning Corsica. Intelligent driving in the bad conditions served him well, avoiding the punctures which delayed Ogier, Robert Kubica and Dani Sordo, all of whom showed impressive pace elsewhere. Reaction among the drivers, especially those discovering the uniquely demanding mountain asphalt roads and the mercurial weather patterns for the first time ranged from horror to enchantment. 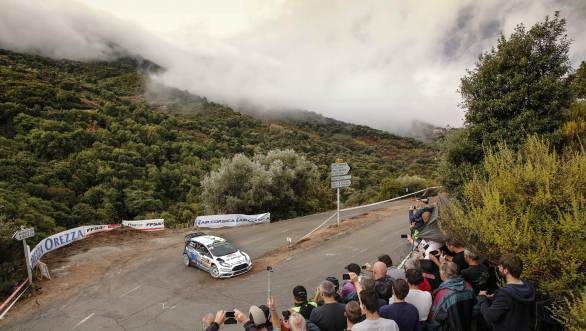 Corsica retained its special characteristics, demanding endurance ranging through long stages (two of which were cancelled because of the conditions) and breaking away from the localised stages which characterise current WRC events. Every night the rally stopped in a new town, quite like the old days. The only concession to current WRC idiom was the central servicing, held in Corte in the middle of the island. However difficult were the logistics, the challenge of driving in the Island was for all to savour. The gearbox trouble suffered by Ogier at the end of the Day 1 drive to Bastia was a big shock and immediately forced him in to running under Rally2 rules the next morning. The ten minute penalty for missing the road section landed Ogier finishing 15th overall. When similar troubles occurred to Latvala on the first stage the next day there was tension in the Volkswagen camp. A replacement gearbox at midday service did the trick for Latvala who was now able to pass Evans into the lead. Andreas Mikkelsen meanwhile had a slow start but as conditions improved he speeded up and closed up to within 3.2 seconds of Evans at the finish. Latvala: "Incredible! Unimaginable! (In French). I prepared those words for Australia, just in case. French is a difficult language but I try to learn it. It's really great to win. It was not easy to come to this event after the crash we had during the tests. It was not the best preparation so I had a lot of things in my head. How I have to approach this rally? How I take speed ? I decided for a plan with careful driving. We were not necessarily the fastest but we just had the control of the driving all the time." Citroen drivers Kris Meeke and Mads Ostberg were under strict instructions to finish the rally and take no risks, settling in fourth and sixth places respectively, but both of them well off the pace. Also cautious was Stephane Lefebvre again in a WRC and came eleventh. All four Hyundai drivers were well placed but Thierry Neuville continued his unhappy season by hitting a stone bridge parapet on the opening stage and scored poor times thereafter. Once again Hayden Paddon was the highest placed finisher after Dani Sordo was initially lying fourth before suffering a puncture and Kevin Abbring was fifth when he crashed on the penultimate stage. M-Sport's delight at the effective drive by Evans and seeing privateer Robert Kubica momentarily hold the lead was balanced by disappointment at the trouble that Ott Tanak experienced, never feeling at ease in the conditions. Evans commented afterwards, "It didn't feel like we were doing anything special. We just happened to click in those conditions and it worked. Obviously the times were there. It was a really positive start from the rally and we just had to carry on. It wasn't easy but it got easier so yes it was a good start." In the supposed favour of the French drivers experienced in asphalt rallying, it was curious that the two best French drivers (Bryan Bouffier and Stephane Sarrazin) finished only eighth and ninth, also in Fords. Drivers in WRC2 had to nominate in advance which events they wished to count, with their poorest score being discounted. None of the series' three leading drivers opted to compete in Corsica so this presented Esapekka Lappi with an opportunity to move up the charts although his teammate Pontus Tidemand was fastest in the category on Shakedown. Seventeen cars were entered including five in the Production Cup class, but there were three non starters so 14 who took the start ramp. Battle was joined on Friday between the Skoda of Pontus Tidemand fastest also on stage 1 and the Peugeot of Craig Breen 2.6 seconds behind. Lappi struggled with the dirt on the road while Armin Kremer spun at high speed. Eric Camilli had brake troubles, Julien Maurin spun and stalled. On stage 3 (the second stage to run) Tidemand stopped with suspension damage and Breen was ahead. Quentin Giordano stopped. Day 2 was again just two stages, stage 4 being cancelled overnight and Julien Maurin took the lead when Breen was over cautious on the first stage dropping him behind Maurin and Esapekka Lappi. Breen then punctured on the second stage and had to stop to change the wheel and was down into sixth place. Lappi finished the day 19 seconds behind Maurin. Eric Camilli lost over two minutes when he touched a stone, punctured and then spun, finishing the day in fifth place behind his Oreca teammate Teemo Suninen. Maurin came safely to the finish to score his first victory of the season in his Pirelli-shod RRC car ahead of the Michelin R5s of Esapekka Lappi, Eric Camilli and Craig Breen but Armin Kremer went off the road and retired while Tidemand retired as well after sliding off the road on a patch of mud into a deep ditch. In the WRC2 standings non competing Al Attiyah retained his lead in the series by nine points ahead of Lappi, both with six event starts, but the competition was still wide open with Protasov, Al Kuwari and Ketomaa all still challengers. As Corsica was part of the Junior WRC series the mainly parallel WRC3 series once again had a strong contingent, where drivers had to nominate in advance which events they wished to count, with their poorest score being discounted. 11 crews started in Junior with one non Citroen driver making the number up to 14 in WRC3. A win could give Frenchman Quentin Gilbert the chance to win both series. Ole Christian Veiby said of the rain during Shakedown that it was a challenge - his only experience of rallying in the rain was at Monte Carlo Rally. On the Friday 20 year old Yohan Rossel led Simone Tempestini ahead of Terry Folb. On Day 2 Rossel was trouble by a wrong set-up and then brake problems and Folb had rear suspension trouble so on Saturday evening it was Quentin Gilbert in the lead. Gilbert held his lead to win both categories for the fourth time in 2015 finishing ahead of ahead of Tempestini and Folb in WRC3 and of Folb and Veiby in the Juniors. Victory also secured for Gilbert both the Junior and the WRC3 titles. There were two competitors in the penultimate round of the inaugural R-GT Cup, Romain Dumas ended the first day leading Francois Delecour in their Porsche 911 GT-3s despite suffering a gearbox problem. Dumas stopped on the first stage of Day 2 which left Delecour unchallenged but complaining about poor traction. Securing a maximum points score gave Delecour victory in the R-GT Cup in its inaugural year with one round to go (Valais Rally in Switzerland).